Skiers, did you know the ski boot is your most important piece of equipment? This may be counter intuitive but it’s true. This is because the ski boot transmits the motion of your hips and knees to the ski which allows you to make quick turns. For this reason, aggressive skiers prefer a more rigid boot. 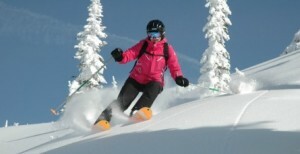 A skier makes a turn by putting pressure on the inside edge of the downhill ski while rotating the hip and knee internally. Anything that impedes this motion will create problems over time that lead to injury. Improper fitting boots will make it more difficult to transmit forces from the hips and knees to the skis; this makes you work harder, putting more strain on the muscles and joints to make a turn. The ski boot creates a unique situation in foot mechanics. Sagital plane motion (up and down) of the foot is restricted in the boot, however the foot still has the ability to supinate and pronate (roll in and out from side to side). Some people have an innately flexible foot that is subject to more pronation which causes a flattening of the arch. This increased pronation will make it more difficult to transfer your weight to the inside edge of the ski preventing you from performing a quick, aggressive turn. Ski orthotics will help skiers with this issue. Ski orthotics are similar to sneaker orthotics, however there are differences. With ski boot orthotics, shock absorption is less important, while motion control is paramount. The orthotic will hold the foot in a neutral position, neither pronated or supinated, and prevent flattening of the arch. This position will allow for the best contact between your foot and the boot — allowing you to feel more connected to the skis. Ultimately, you will find it easier to make those sharp quick turns down the slopes. Being avid skiers, we know what mechanics are involved in skiing, and can address specific problems you may be having. We recommend bringing your ski boots to the office when being fit for a pair of orthotics. Call or make an appointment today and be ready for this ski season!